Instant Tomato Dosa - Easy and quick instant tomato dosa recipe with dosa batter, tasty breakfast/dinner for babies & kids. Heat a tsp of oil in a pan, add red chillies (if using), tomatoes and garlic. Saute it until tomatoes become mushy. Let it cool down for some time. Once the tomatoes are cooled down, grind it with coconut to a fine paste by adding little water. Measure the dosa batter. Keep it ready. In a vessel, add dosa batter, onion, tomato coconut paste, chopped ginger, curry leaves, cumin seeds. Mix well. 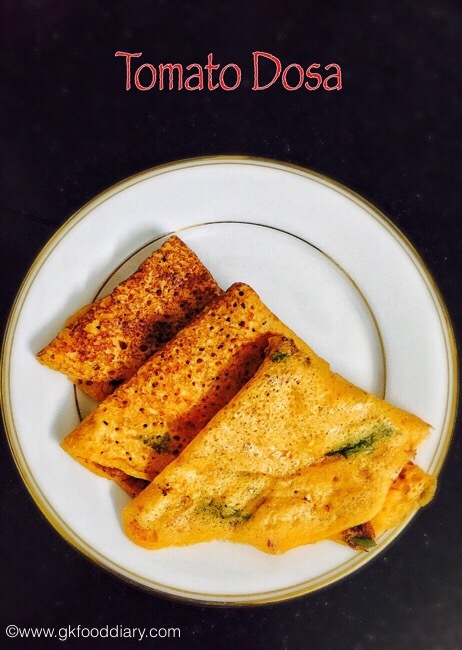 The batter should be like regular dosa batter consistency neither too thick nor runny. Set aside. Heat a dosa tawa, add a ladle of batter to it and spread it to form a circle. Sprinkle oil. Cook it until brown on one side for five minutes and flip the dosa. Cook for 2 more minutes and remove from tawa. Repeat the same process for remaining batter.